Yeah, between that and Speedy stickin' needles in his arm, they were really on a roll back then. 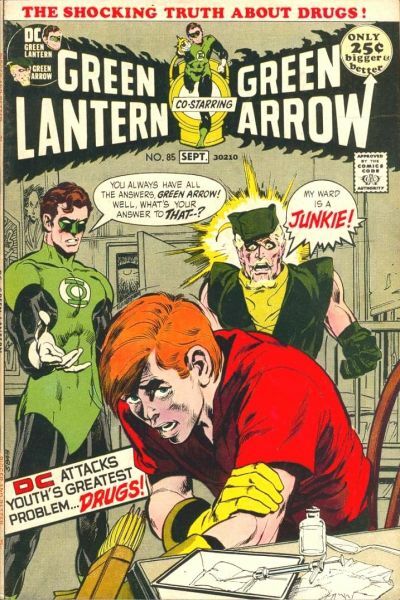 Maybe you shouldn't have named your sidekick Speedy, guy. Would anyone have been surprised if his young ward Eight-Ball started doping up? Last edited by Cipher; 07-11-2014 at 12:04 PM. You know what would have been just perfect irony? If when DC had Prometheus rip his arm off in "Cry For Justice", it was the left arm, aka "The arm he keeps his drugs in". Ahh, Roy Harper. We all hate you. Sure went on to f*ck Starfire, though. Everybody loved that. Welcome to the black April thread, folks! This thread was doomed from conception. No, she and Todd never did it. He was just hamming it up, apparently. TBH, I think Jason's in the closet. Nothing can convince me otherwise. Was interracial marriage accepted back then? I'm pretty sure it wasn't more common till the 80's. Cipher: Ah. Well, okay then. Good to see even Slutfire has enough sense not to sleep with Jason F'n Todd. And that theory o'yorn sure would explain a lot of Jason's latent rage issues. Cubed: Most likely not. Just a high-profile example of 70s comics trying to be "hip" and "cutting edge" while clumsily shining a spotlight on social issues. How about if Angel was made black and she be the first to meet the turtles in one incarnation in the far future, I think that'd be cool. April could still be a redhead and be black. There's plenty of non-soulless pasty gingers that have reddish/auburn hair. And we have some amazing hair dye products out there. Why? And why can't Lois Lane or Barbara Gordon be black? I seriously want to hear your reasoning - and something more substantial than "because they weren't created that way," please. Because there's no point? She's a white character why should her race be changed? Most race changes outside of Nick Fury have always rubbed me the wrong way. IMO, adding more diversity and representation to a genre (and media as a whole) that doesn't have enough of it is a good reason in itself. But to turn it around on you: what's the "point" in keeping them white, exactly? What's the point in keeping characters the race they were introduced as? Is this a trick question? You sound like a token-er. There's nothing in April's Backstory that requires her to be of any ethnicity. Last edited by plastroncafe; 07-11-2014 at 02:02 PM. Reason: edited: not worth the effort. So... do you not have a valid reason why those characters have to stay white? Any reason at all why their whiteness is an essential part of who they are, aside from them traditionally being portrayed that way? Because that is a really weak argument. It's a legitimate issue, whether or not you see it that way. I've already explained why, but it's worth adding - many of the most popular media/genre characters (like Lois Lane and Barbara Gordon, your examples) were developed in a time when seeing people of colour in strong, important central roles was incredibly rare, and even when they were, their portrayals often included troubling stereotypes. Backward times, basically. And without challenging the racial identity of these characters and those portrayals -- and yes, sometimes changing them -- we're reinforcing an outdated status quo. KERRI WASHINGTON FOR APRIL O'NEIL IN TMNT 2!!!! Frankly, I think it's generally best that they just come up with entirely new characters rather than "tweak" existing ones. If for no other reason than, someone always WILL complain and it's just safer. It always seems like a cheap attention-grab when they take a well-known character and do something they know for a fact will be controversial. And it's not like they haven't tried, like how I referenced Milestone comics earlier (Which DC didn't actually create, they were simply licensing partners, although DC eventually did absorb pretty much the entire line later on). That was an honest, earnest attempt at creating a metric ton of black super-hero characters. In fact, there weren't a whole ton of Caucasians walking around Dakota City at all, if memory serves. That raises the question, why didn't the line survive? The reason most-often given is "Lack of consumer interest". So, why didn't anyone want to read the books, which were written, created and drawn by black creators, marketed to a black audience, and featuring an almost-entirely black cast of characters? In absolutely no way could that effort be called pandering, as so many other efforts to be "progressive" in comics have been. So why wasn't there more reader support? Honest question. Honestly, I think *that* is more along the lines of what's needed to "diversify" comics. Organic progression, not controversial race-swapping. I find it funny and a little sad, that it's easier for us to accept a character we already knew, with a "fresh coat of paint" (as if that's all it would be - not an entirely different family background, upbringing, educational opportunities or lifestyle, just a simple coat of paint), than we would accept a brand new character. Create a rival reporter who works at Channel 6, give her her own fully-developed backstory, and have her role essentially be, "The Black April O'Neil"? Hey, that's great, and might actually make for some decent stories, too. Expand their universe, make some new friends/enemies, there's some mileage there. Take April herself, who MOST people readily identify as Caucasian, and make her black because "Why Not?" I think that's honestly a poor idea that still comes from a good place, but is not exactly the right way to move things forward. It wasn't bad when they made Perry White a black guy in "Man of Steel". You know what I liked even *better*, though? When there was a multi-year storyline in the Superman comics where Perry and his wife, Alice, readily adopted a black child named Keith Parks, who was left an orphan after his mother died (I want to say of AIDS, but it's been a few years since I re-read it, and as I said, it went on for years). Keith himself had been well-established in the books for a long time by then (and had actually been occupying the "Jimmy Olsen" role far more frequently than Jimmy himself had been at that particular time, being of great help to Superman on numerous occasions), to the point where once he was adopted by Perry and Alice, it wasn't just accepted, it was *expected*, and it went over quite well with the readers. Probably because, Keith was his own character, they didn't just paint Jimmy Olsen black, or have Perry suddenly be black so his son (adopted or otherwise) could be, too. My memory is fuzzy, but it may have been the first (or at least among the first) examples of a mixed-race family in mainstream comic books. Talk about progressive! I really liked that whole arc; sadly, a few years later, some bored editors retconned the whole thing out so that it never happened. No good deed goes unpunished, I guess. My point being, I'm all for fictional universes being more inclusive, but I think there's a right and wrong way to do it, and I think pallette-swapping is the wrong way. It's lazy and controversial for the sake of being controversial, most of the time. I'd prefer to see newer, fully-realized characters fit those roles. When someone at DC thought they needed more minorities in the Justice League, they created Vixen and Cyborg, both of whom turned out great. Much better, I say, than if they just decided to "paint" Wonder Woman or Aquaman, "just because". To be fair, they also created Vibe at the exact same time, so obviously they were still trying to figure the whole thing out. I'm of a few minds about this. The first one being, above everything else, whatever the motivations for "changing" an existing character's race, it doesn't matter. It's neither here nor there. The second being, yes, while it's probably better to introduce new characters with their own identity, who can make better use of their backgrounds, I'm all for changing a character in a new interpretation as well, if it helps diversify a cast more believably. Multi-decade fictional properties (what we're talking about when we talk about comic-book franchises) are inherently inorganic things. They're more established and increasingly more niche, making the launch of entirely new characters difficult. Most fiction is one-and-done. It doesn't stick around for decades of alteration and retelling. We're going to get change here. Since the status quo reflects inherently inorganic limitations to begin with (namely that, for some of the older properties, companies would whitewash an entire cast in the name of propriety), I have no problem with that being altered to, let alone be more inclusive, just be more realistic. Splinter can be a mutated rat, or he can be the once-human Hamato Yoshi. He can be a vengeful, short-sited purveyor of the old ways, or he can be a humble father intent on keeping his sons from harm. Casey can be a whacked-out vigilante, a father, a struggling teen. April can be a reporter, a frustrated computer technician, in her thirties, in her twenties, in her teens. Karai can be an amoral ninja leader, Shredder's conflicted daughter, or a sycophant villain. None of the Shredders are even remotely similar. We've already gotten many interpretations of characters which resemble previous ones so little in background or actions they've only kept the name and concept. We accept these without much of a kerfuffle. If just changing the color of their skin or ethnic background would somehow, in the light of all those other changes, be too much for you, you really need to ask yourself why. Last edited by Cipher; 07-11-2014 at 03:29 PM. 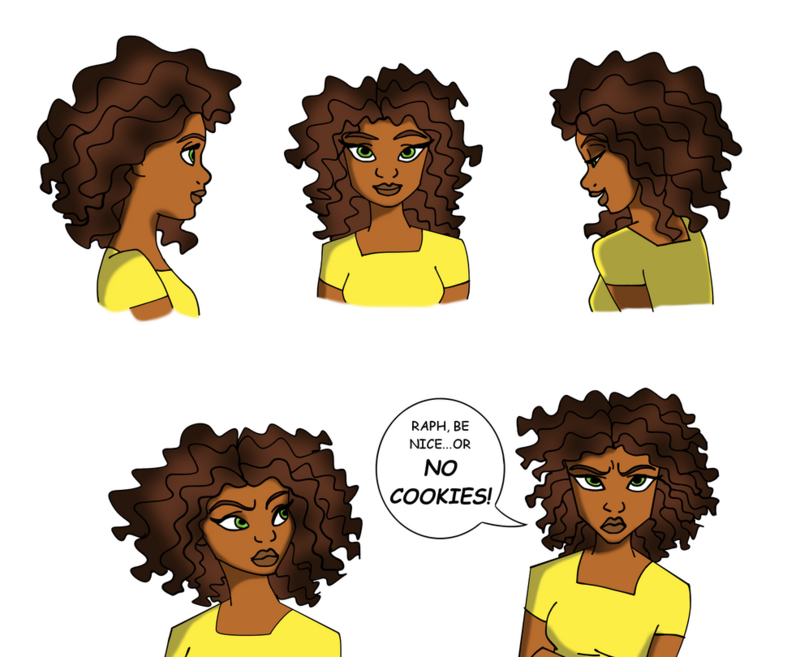 Not to mention have her shipped with Raph.